It took me a while to find this recipe–which is kind of sad, considering it came out when I was five years old. 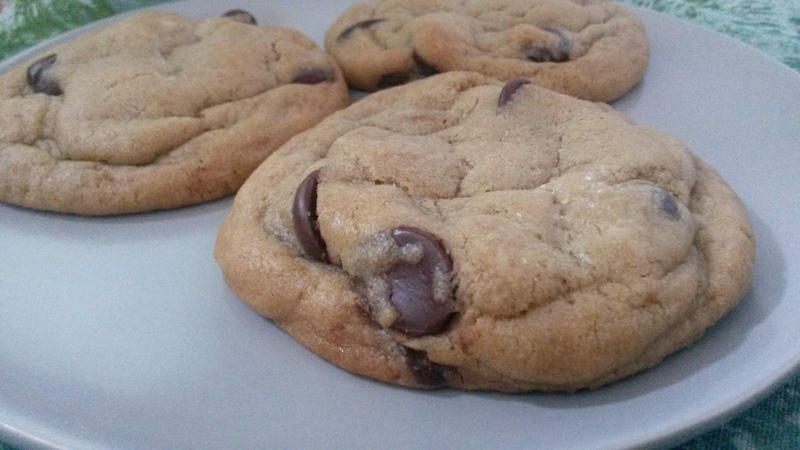 But since the age of seven when I first began baking these cookies, I always used the Nestle Tollhouse recipe. It never occurred to me to try another until the New York Times article came out in 2008. Reading such a detailed breakdown of the chocolate chip cookie was an eye-opener. I tried its suggestion of refrigerating the dough for 36 hours, but I don’t have the patience for that. 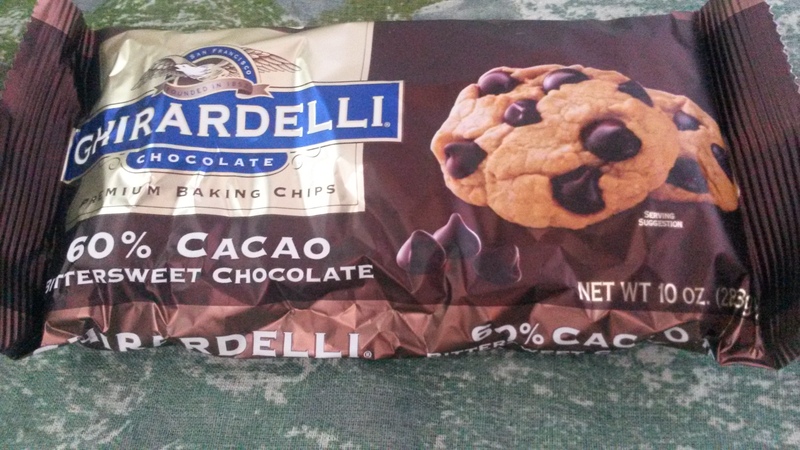 The article did, however, teach me to (a) sprinkle sea salt over the cookies before baking, and (b) switch to a better quality chocolate chip going forward (Ghirardelli’s 60% cacao bittersweet chocolate chips has been my go-to chocolate chip ever since). 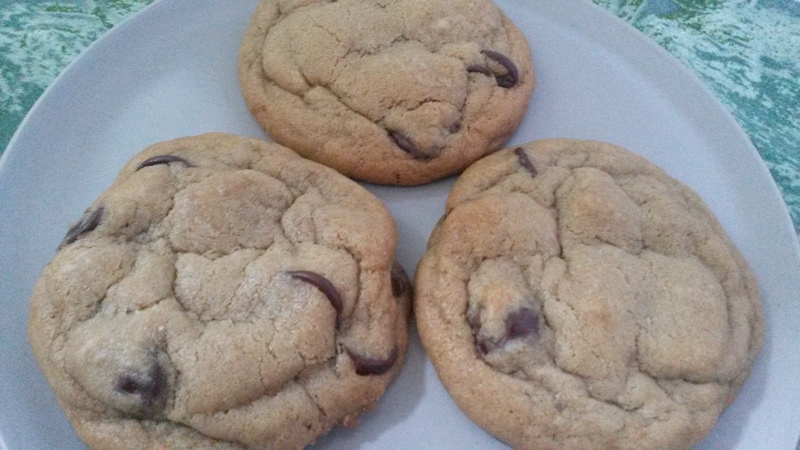 The recipe was good, but what I really wanted was a chewy chocolate chip cookie–and so began a five-year process of trying out different chocolate chip cookie recipes. The recipes were always okay–good, but nothing special, and nothing particularly chewy. Then I found the recipe from Cook’s Illustrated. This one called for melting the butter, using one extra egg yolk, and doing a weird thing to make the cookies look all crackly. Like, you scoop the dough onto a cookie sheet and then split it in half and smash it together again and apparently that produces an aesthetically pleasing cookie? I don’t really see the point. I just refrigerate the dough, shape it into balls, and bake them, and they develop the cracks all on their own. So save yourself the trouble of doing the weird thing. But this recipe is perfect otherwise. 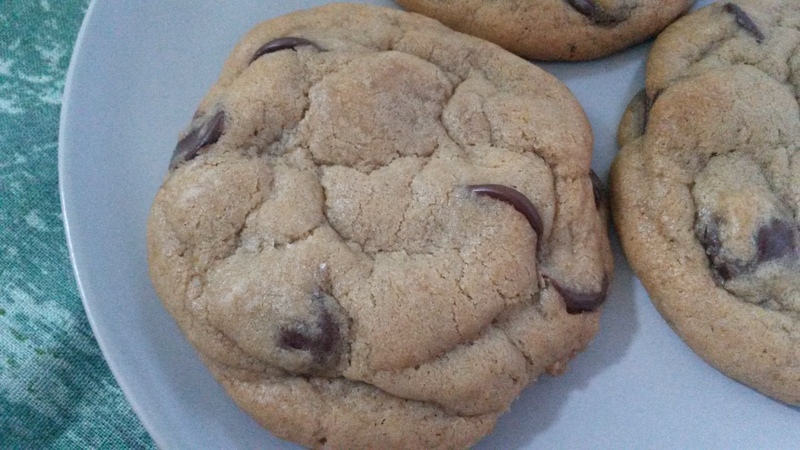 The cookies come out thick, chewy, and chocolatey, with firm outer edges surrounding a wonderfully soft center. One day, when I’m ambitious enough, I’d like to take a stab at making my own recipe based on the findings in the Serious Eats article. A brave, brave soul made over 100 different batches of chocolate chip cookies in order to find out what every element does–melted versus softened butter, brown or white sugar, the ratio of egg whites to egg yolks, even the temperature of the dough when the chocolate chips are added. The findings are amazing, and they give any baker the tools they need to develop a recipe to suit their tastes. But I’ve been too happy with the Cook’s Illustrated recipe to stray. 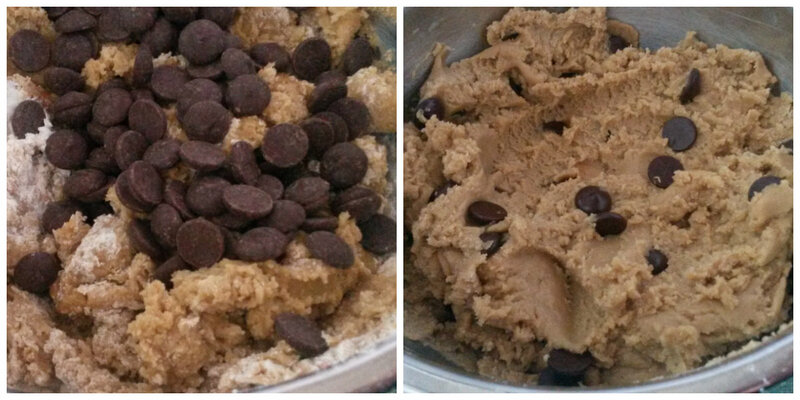 Stirring is my favorite part of baking, and chocolate chip cookie dough in particular is my favorite dough to stir together. My absolute favorite part is stirring in the chocolate chips–after the downpour of chocolate chips, the dough becomes beautiful, chocolatey, polka-dotted chaos (a chaos I need to sample immediately). Stirring is therapeutic for me, and it’s the reason why, after a long day, I have a desperate need to bake something, anything, and find joy in the stirring process. But I wasn’t having a long day when I made these. I baked them for a friend who was kind enough to risk her life by giving me a driving lesson the day before my driving test–which I passed! I now hold a drivers license at age 24. It took me long enough, I know. Let us celebrate with cookies. This got me 15 cookies. Mix together the melted butter, brown sugar, and white sugar until combined. Add the egg, egg yolk, and vanilla. Stir in the flour, the 1/2 tsp of salt, and the baking soda. 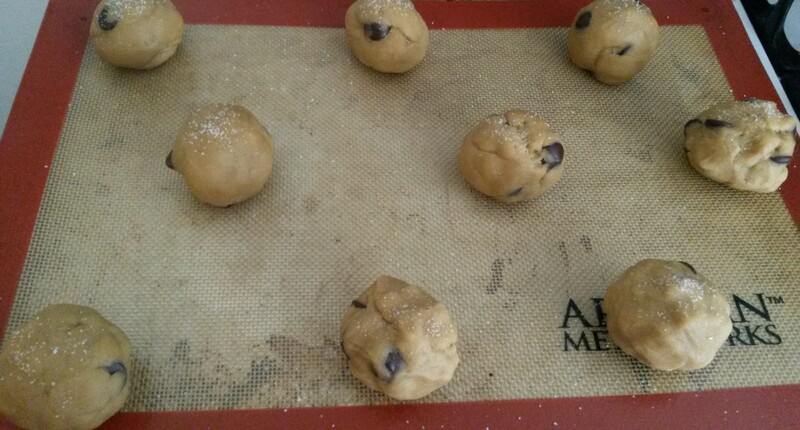 When they are almost integrated, add the chocolate chips to your preference. Chill the dough in the refrigerator, covered, for at least 30 minutes (I’ve done it for up to two days). While it chills, preheat the oven to 325 degrees. Roll about 3-4 tbsp of dough into balls and place them two inches apart on a cookie sheet. Sprinkle sea salt over the balls of dough. Bake for 15-18 minutes, or until the edges are browned while the centers remain soft and puffy (fear not–they will sink and develop cracks within minutes after cooling). Awesome! Let me know how it turns out. I’ll have to check out the cookies on your blog, too! This is exactly what I feel like right now. I say go for it. Cookies for every meal! Dude your blog is blowing up! And I’d like to note my “cewebrity” for being the chocolate chip cookie recipient mentioned– they were really, really good. So good that, even though I offered to share them, I pretended like I didn’t have enough to share with the entire team. Note: I did, I’m just a jerk and these were SO GOOD I didn’t want to share them with everyone. The sea salt makes a huge difference! Haha you’re definitely the cewebrity between the two of us. I’m glad you liked them! Thank you for the driving lesson, and for dinner. You rule. And sharing is silly, unless I benefit from it.